Preheat oven to 220°C (425°F). Place the juice, sugar, vinegar, cinnamon, cloves and thyme in a medium saucepan over high heat and stir until the sugar has dissolved. Bring to the boil and cook for 30 minutes or until reduced. Remove from the heat, add the port and stir to combine. Strain the glaze into a heatproof jug, discarding the solids. Use a sharp knife to score the skin around the sides and hock of the ham, before using your fingers to gently remove the rind. Trim any excess fat. Wrap the hock of the ham with non-stick baking paper followed by aluminium foil. Place the ham, top-side down, in a tight-fitting, deep-sided roasting pan. Pour the glaze over the ham and roast for 40 minutes. Remove from the oven and reduce the oven temperature to 200°C (400°F). 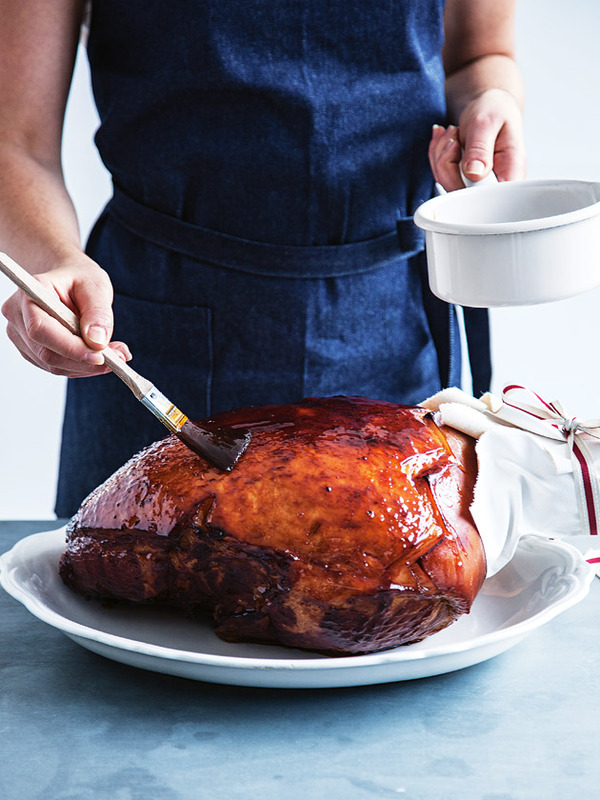 Turn the ham over, baste with the glaze and roast for a further 20–25 minutes or until golden. Everybody loved the ham. Thankyou Donna. This recipe is the bomb! The ham was loved by everyone at my family Christmas and so easy to prepare. I will use this every year from now on. This seems a lot of liquid. Do you put the whole lot in with the ham- it would seem to be swimming more than being glazed. Thank you Donna Hay, this was my first attempt of making a baked ham and I nailed it! Everyone was talking about it and asking for more. I will make this every year now! Hi Rebecca, as we haven’t tested a half ham it is hard for us to say. I would check at the halfway point. Cook the ham for the first 40 minutes as suggested and then check every 15 minutes. Merry Christmas! Can I prepare this the day before and serve cold? Simply delicious and very easy. Has been a family favourite and is requested again for Christmas!